We are the "Adventure People" and have the eco-system in the forefront of our minds. Choose from our list of exciting Tours and get the experience and memories of a lifetime. Contact us to find out about group rates and special reduction packages. Enable alternate wide format view? We depart Ogle Airstrip at 01:00hrs for 50 minutes to an hour flight over the breath-taking landscape and amazing sceneries of beautiful Guyana. This tour takes you to our most famous waterfall. 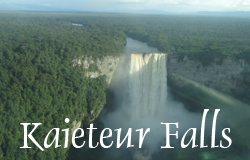 First we fly deep into the tropical rainforest, over rivers of different colors and trees of varying hues to the 226 meters Kaieteur Falls, the highest single drop fall in the world. We will hike the rainforest and view the falls from several vantage points that offer excellent photo opportunities after which lunch will be served. -Georgetown and the Demerara River could be seen immediately after take-off. -12 mins after take-off, CBJ Int'l Airport could be seen out the left windows. -10 mins after, Bartica and Essequibo River could be seen out of the right windows. -25 mins after, Omai Gold Mines should be visible out of the left windows in a distance. -7 mins after, the aircraft will begin crossing the Pakaraima Mountain Range. -6 mins after, the aircraft will be over Kaieteur Falls. -2. Hours Ground time for tour. What to expect in this Tour Package. Itinerary Is Subject to change depending on weather.No refund for cancellation on day of the tour. Copyright © 2019 -Rainforest Tours - All rights reserved.